Rick Byers has been entertaining Georgia, Tennessee, Alabama, North Carolina, Florida for over 10 years now. Rick has performed country, southern rock, blue grass and Americana at many prestigious venues such as Mad Life Studios and Charities like The Belle Meade Plantation-Nashville TN. Also Cobb and Paulding Rodeos and the Georgia State Fair. He has opened for big acts such as Confederate Railroad and Ricochet. He has been a multi nominated nominee in The Georgia Country Awards for Male Artist of the Year the last three years. Other venues Rick has performing in has been Rocco’s Pub in Jasper, Sixes Tavern in Cartersville, Crescent City Tavern in Dalton, Fireside Grill in Chattanooga and many other throughout Georgia, Tennessee and Alabama. As a military veteran Rick is extremely supportive of local charities and events to support veterans. 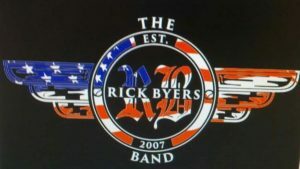 Rick and his band often donate time and performances to charities including many shows at American Legions, St Judes and an annual show at the Murray County Saddle Club for Perk Welch. Rick clears his schedule for at least 6 charity events per year. Having been reviewed by many publications including Full Throttle Magazine, Rising Star Magazine and local newspapers Rick still maintains his signature personality. He always seeks to include the audience in all of his shows by coming off stage and performing among the crowd and demonstrates his desire to be close to the fans by making himself available before, during and after shows for a quick chat and a friendly handshake.